ISO 3103 is a standard published by the International Organization for Standardization (commonly referred to as ISO), specifying a standardized method for brewing tea, possibly sampled by the standardized methods described in ISO 1839. It was originally laid down in 1980 as BS 6008:1980 by the British Standards Institution. It was produced by ISO Technical Committee 34 (Food products), Sub-Committee 8 (Tea). The method consists in extracting of soluble substances in dried tea leaf, contained in a porcelain or earthenware pot, by means of freshly boiling water, pouring of the liquor into a white porcelain or earthenware bowl, examination of the organoleptic properties of the infused leaf, and of the liquor with or without milk, or both. This standard is not meant to define the proper method for brewing tea, but rather how to document the tea brewing procedure so sensory comparisons can be made. An example of such a test would be a taste-test to establish which blend of teas to choose for a particular brand or basic label in order to maintain a consistent tasting brewed drink from harvest to harvest. A revised standard is currently under development as ISO/NP 3103. The work was the winner of the parodic Ig Nobel Prize for Literature in 1999. The pot should be white porcelain or glazed earthenware and have a partly serrated edge. It should have a lid that fits loosely inside the pot. If a large pot is used, it should hold a maximum of 310 ml (±8 ml) and must weigh 200 g (±10 g). If a small pot is used, it should hold a maximum of 150 ml (±4 ml) and must weigh 118 g (±10 g). 2 grams of tea (measured to ±2% accuracy) per 100 ml boiling water is placed into the pot. Freshly boiling water is poured into the pot to within 4–6 mm of the brim. Allow 20 seconds for water to cool. The water should be similar to the drinking water where the tea will be consumed. Brewing time is six minutes. The brewed tea is then poured into a white porcelain or glazed earthenware bowl. 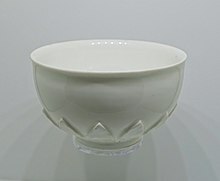 If a large bowl is used, it must have a capacity of 380 ml and weigh 200 g (±20 g). If a small bowl is used, it must have a capacity of 200 ml and weigh 105 g (±20 g). If the test involves milk, then it is added before pouring the infused tea unless that is contrary to the organisation's normal practice. If milk is added after the pouring of tea, it is best added when the liquid is between 65-80°C. 5 ml of milk for the large bowl, or 2.5 ml for the small bowl, is used. The protocol has been criticized for omitting any mention of prewarming the pot. Ireland was the only country to object, and objected on technical grounds. In 2003, the Royal Society of Chemistry published a press release entitled "How to make a Perfect Cup of Tea". ^ "ISO Standard for sampling tea from containers of all sizes". ^ "ISO/NP 3103 - Tea -- Preparation of liquor for use in sensory tests". www.iso.org. Retrieved 2018-04-09. ^ "Fancy a quick cuppa - in 5,000 words?". The Guardian. 2 October 1999. Retrieved 2 November 2013. ^ "The 1999 Ig Nobel Prize Winners". Annals of Improbable Research. Retrieved 2 November 2013. ^ "Feedback column". New Scientist. No. 2207. 9 October 1999. Nowhere, however, is there mention of the ritual of warming the pot, central to the mystical British Tea Ceremony. ^ "How to make a Perfect Cup of Tea" (PDF). Royal Society of Chemistry. 2003. Archived from the original (PDF) on 2014-08-11.